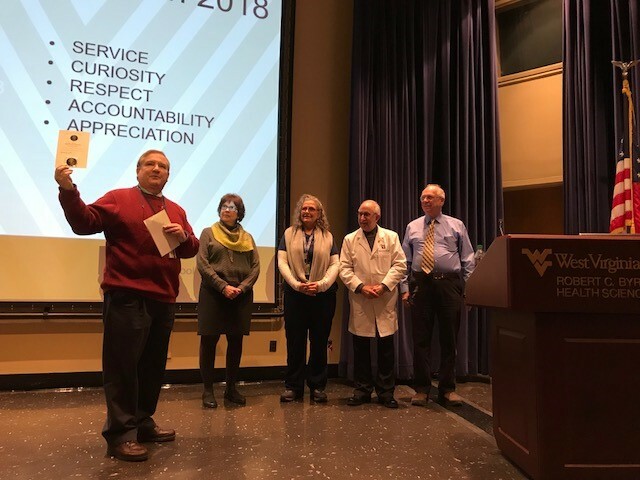 Before ascending into 2018, Dr. Anthony “Tom” Borgia, dean of the WVU School of Dentistry, took a final chance at the school’s January retreat for faculty and staff to commemorate West Virginia University’s 150th anniversary, reflect on our Mountaineer values, and celebrate a few of the School of Dentistry’s strengths – OUR FACULTY AND STAFF. In 2017, as part of the year-long birthday party, the University designed a token of appreciation for select faculty and staff. A single bold, navy blue, celebratory coin was designed to mark the occasion. On one side, it’s embossed with the number 150 and a representation of historic Woodburn Hall. On the flip side, our signature flying WV is encircled by the five words that represent our core Mountaineer values. The coins were created to recognize treasured faculty and staff, highlight those who are committed to our success, and emphasize our Mountaineer values. Just 150 celebratory coins were produced. Because Morgantown is the home base for our land grant university, the coins were only distributed to schools and colleges at our Evansdale and Downtown campuses. The School of Dentistry was fortunate to receive four coins to distribute. According to the guiding principles for distribution, award recipients should be chosen for behaviors that exemplify the values that are the backbone of our University. The Office of the Dean was asked to select faculty or staff known to be of service, to demonstrate curiosity, to show respect, to share appreciation, and to understand accountability. The list of loyal dental school employees who’ve devoted themselves to students, patients and colleagues is long. The Wednesday recognition just scratched the surface of revealing the hard workers, at all levels, who go above and beyond to help make our University community a better place every day. To serve at WVU means to seek opportunities to assist and follow through with the highest quality of attention and detail. Everything we all do is ultimately about service to our students, to our patients or to one another. Narrowing down our team to a single person who represents Service was no easy task, but it was the task at hand. Our Celebratory Coin recipient who exemplifies service is Martha Sturms. Her title is senior administrative assistant but could just as easily be control center commander. Martha began a career at the School of Dentistry in 1974. For seven years, she worked in what was Operative, Crown and Bridge, and Prosthodontics. She took a hiatus from us in 1981 after her son was born and came right back to serve here in our school in 1994 ultimately becoming the senior administrative assistant to the dean. She has served through six deans. That’s six different personalities, unique perspectives and varying senses of humor. 2018 is the start of her 31st year of service to our school. Thank you, Martha, for your commitment to serve. Curiosity abounds in higher education and patient care. The most curious never stop asking questions. They seek opportunities to make change and improvements. They have a knack for innovation, learning and teaching. Inspiring curiosity in others is a testament of their commitment to progress. Our Celebratory Coin recipient who exemplifies Curiosity is Dr. Mohssen Ghalichebaf. For most of us, he’s simply Dr. Mo. Follow his professional trek and you know he has to be a curious one. His education spans multiple continents. Dr. Ghalichebaf’s undergraduate studies were in Istanbul. In 1979, he continued to feed his appetite for curiosity by coming to the United States for a career that has taken him from New York to Indiana to West Virginia. A year after his appointment as a School of Dentistry professor, he became the Director of the Cleft Palate Team Clinic. Invention is a natural result of curiosity and hard work. Dr. Ghalichebaf's is behind at least three inventions including a flashing light system for recording jaw relation, a shield for protecting teeth during etching, and a device for prevention of cross-contamination due to needle puncture. Here’s some of what others share about Dr. Ghalichebaf. Those comments come from a former student who graduated in the early 90’s. Dr. Ghalichebaf has published aspects of his work more than a dozen times. Thank you, Dr. Ghalichebaf, for inspiring curiosity. The third core Mountaineer value we highlighted is Respect. To be respectful is to be inclusive, inviting and transparent. At West Virginia University, pride in academics and loyalty to Mountaineer tradition are sure signs of respect. Dr. Robert “Coach” Wanker is received our Celebratory Coin representing Respect. Dr. Wanker began his love for and respect of WVU in 1967 when he first became a School of Dentistry student. Coach, as he’s known, left our Mountains of West Virginia to return to his native New York upon his graduation in 1971. In less than a year, he found himself right back here to the place he’s called home for all of his professional life. Since 1972, he’s been an instructor, assistant professor and then professor here at our school. His respect for dentistry and improving oral health is apparent through his positions of leadership and participation in international, national and state dental societies and associations. Few respect Mountaineer values and tradition like Dr. Wanker. It made him perfect to oversee student and alumni affairs. That’s a job he’s held for a dozen years. If you’re within ear-shot, you know Dr. Wanker’s infectious laughter. As Dr. Wanker embodies and embraces Mountaineers GO FIRST, but he’s also coined us the number one dental school of all time and all places. Congratulations Dr. Wanker. Let’s Go Mountaineers. With our final 150 Celebratory Coin, we focused on the core Mountaineer value of Appreciation. At WVU, appreciation is shown through the support of others. It means valuing the contributions of everyone who is part of your team. When you appreciate the patients you serve, the dentists you work with, your coworkers and the students you influence, you build a stronger Mountaineer community. While our 150 Celebratory Coins focus on faculty and staff just in Morgantown, the recipient of the coin for appreciation has an outreach all her own. From all corners of the state and beyond the West Virginia border, this person impacts the lives of some of the most delicate patients. Dental hygienist Therese Bonasso is, without question, appreciative of the needs of her patients and of the group that works tirelessly in pediatric dentistry. It’s no secret within our school that many of our pediatric patients and their parents consult us for care in challenging circumstances. Therese has devoted her career to accepting and appreciating the nuances that make her patients unique. Therese, the daughter of a dentist, learned early to appreciate the impact dental professionals can have on a patient. How do we know she’s appreciated? If you want an appointment with her in the spring, it would be good to call for a time TODAY. Therese, thank you for representing the core Mountaineer value of Appreciation in our clinic and at multiple public awareness events across the state. Before wrapping up the ceremony, Borgia reminded faculty and staff of our fifth core Mountaineer value. That means performing at our very best. It means responsiveness to the patients, students, faculty and staff who rely on us daily. To be accountable is to work efficiently and effectively.